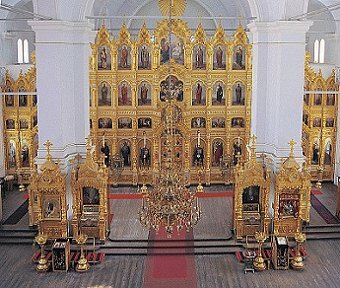 The interior of the kyriakon of the skete of Prophet Elijah where the magnificent, gold-covered iconostasis is dominant. 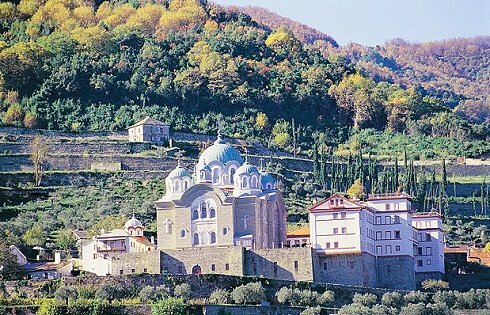 The skete of Prophet Elijah, a dependency of the monastery, dominates the wooded hills above it with its multi-storey buildings. It is located half an hour’s walk north-west of the monastery along an exceptionally beautiful path. Shortly before the middle of the eighteenth century only a few kellia existed in this area. Among them was the kelli of Prophet Elijah which was enlarged by Blessed Paisy Velichkovsky and raised to the status to a skete. Blessed Paisy Velichkovsky, the most prominent figure of Slavic monasticism in his time, translated the Philokalia and spread the philokalic spirit around the Slavic world. He settled in the area of the monastery in 1746 and in a short time was able to attract around him a large number of monks, a fact that favoured the establishment of a skete functioning according to coenobitic principles. Although no evidence exists of a constitution governing the operation of that establishment as a skete, it was nevertheless recognized as such by the Ecumenical Patriarch Seraphim I who was staying in the monastery at that time. The growth of Velichkovsky’s brotherhood led him in 1762 to make the decision of moving to Simonopetra with his brothers and settling in that monastery, abandoned because of heavy debts. However after only a few months there, he himself was forced to leave it. Finally, after a short period spent back at the skete of Prophet Elijah, he left for Wallachia from where he was able to transmit a new spirit to Slavic monasticism. 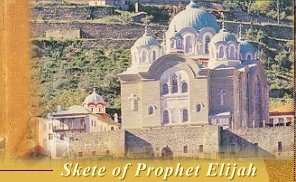 After a period of decrease and decline during the last century, the skete of Prophet Elijah was occupied again in 1992 by the devout and diligent brotherhood of the industrious Elder and Dikaeos Archimandrite Joachim (Karachristos), a fact signalling the start of a new period of sound administration and spiritual flourishing for the skete.